Talented Executive Chef Rob Stella brings an impressive culinary portfolio to The Supper Room at Glenmere Mansion an elegant fine dining restaurant located at Glenmere Mansion, a luxurious 18-room and suite Relais & Chateaux Country House Hotel, in Chester, New York. Chef Rob Stella graciously shares his recipes for Boneless Rack of Lamb with Chickpea Panisse, Piquillo Peppers and Roasted Eggplant; and Roasted Labelle Farms Foie Gras with Rhubarb Sorbet, Toasted Brioche and Salted Almonds to provide a delectable view of The Supper Room at Glenmere Mansion. I had the opportunity to get to know Chef Rob Stella and his culinary vision for The Supper Room at Glenmere Mansion when I stayed at the hotel and had dinner at the restaurant in late April 2011. 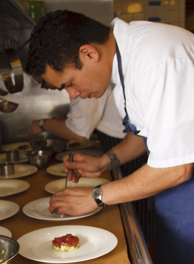 His impressive credentials include graduating from the New York Restaurant School, and later by honing his culinary skills working with notable chefs and top-rated restaurants in the United States and Europe. We enjoyed reminiscing about his restaurant experiences in New York City working with Chef Jean Georges Vongerichten of JoJo and Jean Georges; at Aureole and Patria restaurants; and in Boston for Chef Edward Gannon at Aujourd’hui at the Four Seasons, and for Chef Mark Orfaly at Pigalle. Chef Rob Stella also apprenticed with Chefs Johanna and Ditmar Maier at Michelin-rated Hubertus in Salzburg, Austria, and with Chef Hans Haas at Michelin-rated Tantris in Munich, Germany, before joining the team at Glenmere. His approach at The Supper Room at Glenmere Mansion is fresh, innovative, and creative, aptly utilizing his background to appeal to the eyes as well as the palate. He changes the menu seasonally, adds a few new items as products come into season, and takes advantage of the excellent local products. Married to a chef, with two young sons to raise, when I asked him how he spends his free time when not working at The Supper Room, or busy creating new recipes, he replied, “I sleep.” He graciously shares two of his recipes for Boneless Rack of Lamb with Chickpea Panisse, Piquillo Peppers and Roasted Eggplant; and Roasted Labelle Farms Foie Gras with Rhubarb Sorbet, Toasted Brioche and Salted Almonds. Bon Appetit! Method for the Lamb Roulades: Take one piece of lamb and tightly roll in plastic wrap, and tie at both ends, essentially forming a sausage. Method for the Chickpea Fritters: In a small saucepan, bring milk to a simmer. Add chickpea flour, salt, and cayenne to taste. Whisk until mixture thickens and starts to resemble creamy polenta in consistency. Pour mixture onto a small plastic-wrap lined pan and let cool down. Cut into any shape desired. Pan-fry and place on a napkin to dry. Keep warm. Method for the Roasted Eggplant Puree: Preheat oven to 350° F (177° C). Cut eggplant in half, season well with salt and pepper, rub with olive oil, and spike with garlic slivers. Bake until eggplant is cooked through and soft. Carefully scoop out eggplant flesh from skin and puree in a food processor until smooth. Pass eggplant mix through a tamis or strainer to remove all seeds. Season to taste with salt, pepper, extra virgin olive oil, and white balsamic vinegar. Method for the Piquillo Pepper-Crème Friache: Finely chop the piquillo peppers and fold into the crème friache. Season with salt and pepper. Assembly and plating: Unwrap lamb roulade and season with salt and pepper. In a hot sauté pan, add grape seed oil and roll the roulade, to get an even crust. Place in a 300° F (149° F) oven until meat registers 135° F (57° C). Let meat rest for 5 minutes. On a large entrée plate, place a small mound of eggplant puree. On the opposite side of the plate, place a warm chickpea fritter. Make a quenelle of the crème friache-piquillo mixture, and place on the fritter. Randomly place sliced lamb on the plate. To finish the dish, garnish the plate with basil chiffonade, eggplant chips, and a spoonful of the lamb jus. Method for the Marcona Almonds: Preheat oven to 325° F (163° C), bake almonds until golden brown, remove and lower oven to 300° F (149° C). Coat almonds with corn syrup and Maldon sea salt, return to oven and bake until almonds are crispy. Cool nuts and place in a container. These will hold for up to 4 days. Method for the Rhubarb Confit: Peel and cut 1 stalk of rhubarb into large batonnets (2½ inch by ¼ inch/6.4 cm x 0.6 cm). Reduce water, grenadine, lemon zest, sugar, and sachet bag into a light syrup. Add rhubarb and poach until you can pierce rhubarb with a knife. Rhubarb should still be firm. Let rhubarb cool down in liquid. Strain and set poaching liquid aside for sorbet and for garnish. Method for the Sorbet: Peel and dice the remaining rhubarb, place into poaching liquid, and simmer for 15 minutes or until the rhubarb are fully cooked. Cool down in liquid, puree and spin in an ice cream maker. Assembly and plating: Toast brioche round. Season and cook foie gras by placing it in a hot sauté pan and cook until golden brown, crispy on the outside and soft in the middle. Place 3 pieces of rhubarb confit on a large plate. 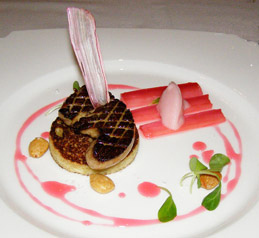 Place toasted brioche on plate and place foie gras on top. Make a small quenelle of rhubarb sorbet and place on confit. Dress plate with the salted almonds, mache greens, and a drizzle of confit liquid. Finish by placing a pinch of Maldon sea salt on the foie gras. The Supper Room is open for dinner Thursday through Saturday with 2 seatings at 6:00 pm and 8:15 pm. A Champagne Brunch is served on Sundays from 11:00 am until 2:00 pm. 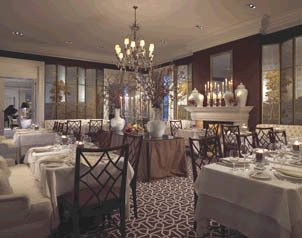 Read about Glenmere Mansion in the Hotels and Resorts section and about The Supper Room in the Restaurants section. Read the Chefs’ Recipes section where Executive Pastry Chef Taiesha Martin graciously shares a few of her recipes for Coconut Tapioca Pudding, Pineapple Mojito Sorbet, Sautéed Vanilla Pineapple, and Candied Coconut to complement Executive Chef Rob Stella’s savory menu and provides a delectable glimpse into her culinary vision and The Supper Room at Glenmere Mansion. Read more about the Hudson Valley in the Destinations, Hotels and Resorts, Restaurants, and Chefs’ Recipes sections. For additional information on the Historic Hudson Valley, please visit the website: www.HudsonValley.org. © May 2011. Luxury Experience. www.LuxuryExperience.com All rights reserved.